Destroyer DVD and Blu-ray release date is set for April 23, 2019 and available on Digital HD from Amazon Video and iTunes on April 9, 2019. Los Angeles detective Erin Bell, a washed up former FBI agent who suffered a nervous breakdown after a botched undercover bank robbery sting in her youth resulted in the death of her partner, has lost her way. She's often drunk and looks like she has been worn down by life. She has difficulty relating to anyone, including her ex-husband or her 16-year-old daughter. Everything changes after former gang leader and crime boss, Silas, resurfaces in the City of Angels. Bell must revisit old haunts and the last members of the gang to find a way to finally deal with her regrets and bring Silas to justice. 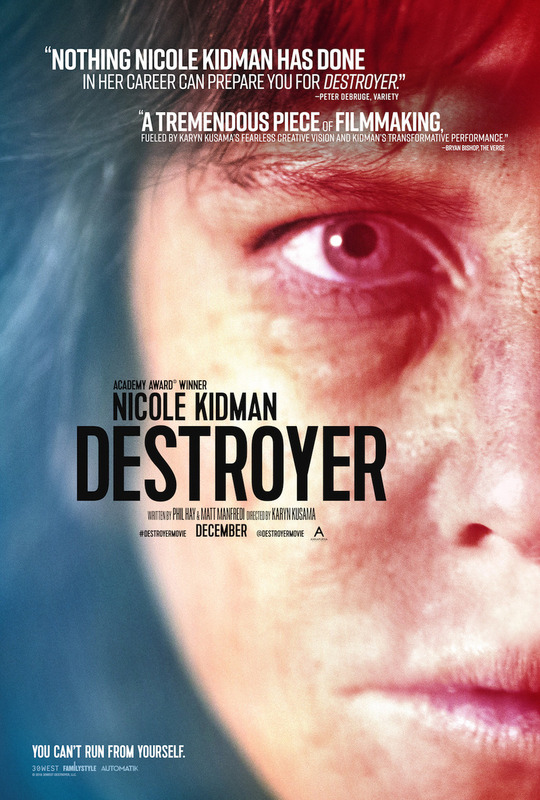 DVDs Release Dates is the best source to find out when does Destroyer come out on DVD and Blu-ray. Dates do change so check back often as the release approaches.